As surely as spring follows winter and summer follows spring, government regulation follows tragedy. Call it “The Schlock Doctrine.” With emotions running high, ill-considered laws get rushed through legislative bodies in a desperate attempt to show the voting public that something is being done. It happens after gun-massacres, it happens after terrorist attacks, and it will happen after the oil spill currently spreading across the Gulf of Mexico. 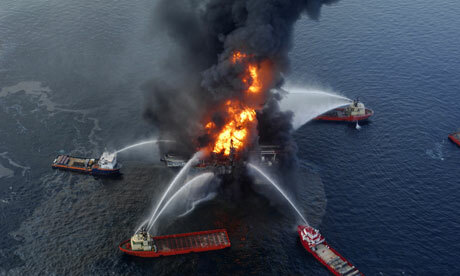 On April 20, the well being drilled by BP’s Deepwater Horizon oil rig blew its top. Eleven workers lost their lives in the subsequent explosion and fire, with the rig itself eventually sinking to the bottom of the Gulf. As the resultant oil slick grows by thousands of barrels of oil a day, threatening local wildlife, coastlines, and livelihoods, calls for stricter safety regulations are being heard all around. Some people, though, have other axes to grind. Now, I have no trouble believing that lobbyists and crooked politicians often act in ways that are beneficial to themselves but that expose others to harm. I fail to see, though, how entrusting politicians with complete control is the best way to deal with this general problem. It might have had some good effects in Norway in this one aspect, but will it be good all of the time, or even most of the time? Do other states that “own and control the resources” behave as prudently as Norway does, or are they more reckless on average? To take just one example, Mexico’s state-owned Pemex is responsible for the largest accidental oil spill in history at the Ixtoc-1 oil rig in 1979. The alternative to government control is market incentives. But wait—didn’t market incentives fail to push BP and its partners to install safety devices like remote switches and relief wells? The answer, actually, is no. The market, as is so often the case, was knee-capped by the government, preventing it from properly performing its incentivizing function. As Terence Corcoran, Editor of the Financial Post, points out, the U.S. Oil Pollution Act of 1990 (a date that places it under the watch of that other industry-friendly Bush administration) limits the liability of individual companies to $75 million. With cleanup and damages potentially reaching a cost of $10 billion or more, this is clearly chump change. Corcoran writes, “Short of outright prohibition, the most effective accident-prevention mechanism is to enforce property rights and make sure that companies know in advance and under law that they are fully and directly responsible for whatever havoc their activities cause.” On the other hand, when oil companies know in advance that they will not be held fully responsible for the damages they cause to others, the incentive to avoid disaster is greatly reduced. But don’t blame that on the free market. We need, rather, to prevent governments from rigging the market in favour of their biggest campaign contributors. The way to do that is to remove from government the power to rig markets. "As misguided as it would be to nationalize oil companies, worse still would be to try to wean ourselves off oil altogether, replacing offshore oil rigs with offshore wind farms." As misguided as it would be to nationalize oil companies, worse still would be to try to wean ourselves off oil altogether, replacing offshore oil rigs with offshore wind farms. New York Times columnist Jim Dwyer wrote recently about a proposed grove of giant windmills off the coast of Cape Cod that has won federal approval. If built, Dwyer writes, “they could replace the electricity made by more than 100 million gallons of oil annually.” New York City is also apparently looking into developing an offshore wind park that could produce enough energy to power 250,000 homes. One problem often raised with regard to wind power is that it is intermittent—that is to say, the wind doesn’t always blow, and when it doesn’t blow, windmills produce no electricity. This is not so much of a problem if wind is a supplementary source of power. But even as the primary source, wind power could be stored up in any number of ways, although not without a cost. Fair enough. But the best way to deal with the off-the-books costs of oil spills is not to balance them with off-the-electricity-bill subsidies for wind power. We should instead remove oil producers’ distortionary legal exemption from liability and require them to assume the full costs of securing and insuring their own activities. If the market then determines that wind is competitive with oil for electricity generation, so be it. But forcing taxpayers to subsidize wind power is no better than forcing them to subsidize oil by paying for cleanup and damages after a spill. As with the financial crisis, bad government regulation must bear its share of the responsibility for this tragedy. Many will nonetheless try to pin the blame wholly on corporate greed, and use the spill to justify further government regulation. But there is an important difference between the greed of an honest producer and the greed of a “producer” who seeks to gain from government favours. The former is beneficial to others in a society; the latter is harmful, but can only thrive within a corrupt and corrupting regulated economy. With a little luck, as bad as this spill may turn out to be, it will not cause too much irreparable harm. As The Economist pointed out recently, “The immediate carnage that an oil spill can wreak does not normally lead to lasting environmental damage,” though delicate Louisiana wetlands may be more vulnerable than your average beach or rocky shoal. Crude oil from undersea wells is also “easier to degrade than the stuff that sometimes spills from tankers,” and the Gulf’s “warmer, choppier environment” is hardier than, say, the Alaskan environment dumped on by the Exxon Valdez. Whatever the future may hold, oil is still worth drilling for today. Before we allow recent efforts to expand offshore drilling in the United States and elsewhere to be forestalled or derailed, we should remember that whatever our precautions, accidents happen. In the long run, the quixotic quest for perfect safety will benefit no one except those who wish to hold ever more tightly to the reins of power. We will never entirely eliminate oil spills, but if we want to make them less likely, free market incentives are our best bet.